If you've got candy making questions, we've got answers. Making chocolate candy is a lot of fun, but sometimes it can be a bit frustrating. I'm not just talking about when you are eating all the ingredients before you get the candy made! We've included a lot of candy making tips throughout the site, but we do get regular questions from visitors wanting to know a little bit more about one aspect of candy making or another. I figured if one person was asking, there are probably several others who were wondering, but didn't want to ask. So, here's what I've done. In the form below you can ask your chocolate candy questions. I'll do my best to give you an answer as soon as possible. If for some reason I don't know the answer (Surprise, surprise, I don't know everything! :-) ), there's a good chance another chocolate lover will be able to help. Besides that, as this site has grown, we've received hundreds and hundreds of questions. I don't always have time to answer each one personally. Candy making questions are asked all the time. There's a pretty good chance that "your question" has been asked and answered already. To help you locate what you need right away, please use our search feature first (compliments of our friends at Google) to see if you can find what you're looking for. If you can't find it, then come back here and fill out the question form below. Thanks so much! Share Your Candy Making Tips! Have you got a great candy making tip that you picked up somewhere along the line? Maybe it's a little something you learned from trial and error, or a little secret passed down from Grandma. Don't be stingy - Share it with the rest of us! We are all trying to pick up clever little tricks that make our candy making faster, easier or better. Perhaps you've got the answers to some of the questions that have already been asked. Jump right in and add your comments. Feel free to correct me if I'm wrong or give more detail or clarification. There's often more than one "right way" of doing things. I'm always happy to learn, especially when it comes to chocolate! To find the most recently asked questions that need answers, visit the chocolate blog and lend a hand. Thanks again! or A Great Candy Making Tip? Do you have a question about some aspect of chocolate candy making? Ask away! We'd love to help you out. Have you discovered a helpful or clever tip for making delicious or gorgeous chocolates? Don't be stingy! Share with the rest of us. What's the topic of your question or helpful tip? Your question or helpful tip will appear on a Web page exactly the way you enter it here. You can wrap a word in square brackets to make it appear bold. For example [my story] would show as my story on the Web page containing your story. Click below to see questions and answers by other site visitors as well as helpful candy making tips that have been submitted. Go ahead, take a look! Put Chocolate In The Freezer? Sell Homemade Candy From Home On Ebay? Why Are My Lollipops Rough? What Makes Homemade Candy Turn White? How do you get chocolate to stick to cashews? How do you keep caramel from getting hard? Chocolate Almond Bark or Chocolate Chips? Can Chocolate Mint Candy Go Bad? Why did my praline melt in the freezer? 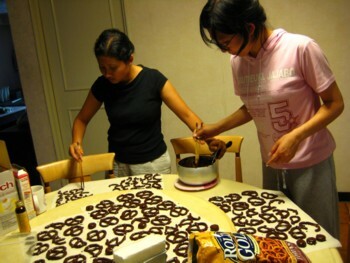 How Much Chocolate Needed To Make 200 Pretzel Rods? Can Caramels Be Melted In A Chocolate Pot? How Many Lbs Of Candy Melts? How long does divinity need to set out before done? How can I get white chocolate to stay on strawberries? Why did my dark chocolate bark turn whitish? How to figure out how much chocolate wafers to buy? How Many Pounds Of Chocolate? How long does packaged dry fondant last? I make cherry chocolates and usually I freeze them. How many monograms can I make with 1 bag of candy melts? Can I Fix Chocolate Pretzels After They Turned White? Can you mix chocolate chips with almond bark? Mix Melted Chocolate And Carmel? How long with it take melted milk chocolate to harden in the fridge?? How can I melt milk chocolate chips to use for lollipops? How Much Chocolate Do I Buy? How to keep chocolate candy from getting soft? Why Won't My Caramels Harden? Chocolate Peanut Butter Balls Are Too Soft! How many cups of chocolate melts make 16oz.? Chocolate Peanut Butter Balls Turned To Fudge! Why didn't my peanut clusters harden? How long do chocolate covered pretzels stay fresh? Can Cake Balls Be Frozen? Is it true you should not make pralines unless the weather is nice? Chocolate keeps melting after it is taken out of the mold! Why did my molded chocolate have parts stay stuck in the mold? Why does the chocolate "pop off" my brittle? How many pounds of chocolate wafers? How long does candy from molds last? Hard Caramel Type Of Square? How Do I Get My Sugar Candy To Stay Firm? Chocolate on dipped balls spreading too much!!! Is there something I can put in the chocolate? Is it possible to add shine to my dull chocolate candies (blueberry clusters)? Can I melt wafers straight from the freezer? Can I use almond bark in place of candy melts? How long can a chocolate covered apple be refrigerated? Can you tint the white chocolate? Will my chocolate covered pretzels look funny? What is the best temperature to display chocolate? How long are candy wafers good? Can chocolate fondue be frozen? How to keep chocolate from melting in your hand? Why do candy molds go white and leave a white coating on my chocolate? How long can candy lollipops be made in advance? How Long Can I Store Candy? Three strikes on trying to reach the Soft Ball Stage! How do I make too soft truffle ganache firmer? Where can I buy a good dark chocolate to make almond clusters? Does homemade chocolate need to be tempered? Do I have to temper milk/white chocolate for multi colored lollipops? How long will my homemade chocolates last in retail shop? Why does the chocolate crack on my peanutbutter eggs? How do you prevent chocolate dipped candies from melting? Can you keep chocolate candy from getting soft after making it? What is the difference between milk chocolate coating and chocolate chips? Can you recook homemade peanut brittle or fix it? How long can hard candies be stored? How long can you store chocolate covered pretzels and where should you keep them? Can you freeze pecan graham crackers? Need a recipe for melted chocolate on sponge candy that is thin? How does weather affect divinity? How Do You Thin Down Peanut Butter? How long can dipped chocolate last? Can you freeze date balls and rice krispy treats? How can I get the Chocolate to be thinner for dipping? Can I add cocoa powder to my chocolate wafers to make the chocolate darker? How long can I store chocolate covered pretzels (homemade) and what is the best way to store them? How long can you store candies after you make them? I am having trouble melting waffers. What can I use in chocolate to keep it from melting? How long will homemade hard candy suckers be good? Why does my hard candy turn to sugar? Exactly how long can you make chocolates in advance? Which type of cocoa powder is used in making candy? How much quantity of Cocoa powder is to be used to prepare a sweet candy of 1 Kg. How to make chocalate shells to hold ice cream? Will Chocolate Candy Stay Fresh? Why Does My Chocolate Crack? what should i use if i want my dark chcolate to be sweet? Emergency!! Can I add melted chocolate to warm cream? Can chocolate cups be made in advance? How Long Can You Freeze Candy? Chocolate staying soft even in the freezer!!! A way to keep homemade suckers from sticking together? What are all the different types of chocolate molds? Chocolate Chips To Mold Candy? What makes Pralines turn Sugary? Peanut Brittle Comes Out Too Chewy! Candy Thermometer that says soft ball, hard crack, etc. Why does my candy turn hard and dry? Why does my homemade chocolate melt so easy? Making Candy Layers Stick Together? How long will chocolate candy stay fresh after making? Color White Chocolate With Food Coloring? How long can I store homemade chocolate candy? Recipes For Chocolate Using Cocoa Powder? Who Can Make My Chocolates? How long does chocolate fudge stay fresh? Do You Sell The Chocolate? How does adding baking soda affect how taffy stretches? How long will Christmas Chocolate Candy Gifts keep? Do you have a recipe for a chocolate bar??? How do I make a 60% dark chocolate bar using my own sweetener? Best Way To Ship Chocolates In The Summer? Natural Sugar Substitute vs. Artificial Sweetener "Terminology"
How Do You Make A Hard Candy Shell? How Long Will Chocolate Candy Stay Fresh? Why Is My Chewy Chocolate Taffy Turning Crumbly After A Few Days? Why is my sugar turning brown?